The recent torrential downpours in California threatened to put an end to a road trip to Death Valley that my wife and I had been planning since last October. The Oroville Dam disaster, flooding, washed out roads and mudslides have the effect of putting a damper on best-laid plans. There were also forecasts of snow and nighttime sub-freezing temperatures on the eastern side of the Sierras. To top it all off, after our decision to go ahead anyway, we were involved in a non-injury car accident the day before our planned departure. Yet with these on our minds, we decided to stick to the plan. We packed our gear into a Jeep provided by the insurance company and headed out a day later than scheduled. Despite all the years both my wife and I had been living in southern California, we’d finally go to Death Valley from the Pacific Northwest. This is a surprise to most people who hear this, including myself, but Death Valley is the largest national park in the continental U.S. It’s acreage equals the size of Connecticut. That fact alone means that its attractions on average are separated by great distances. My plan was to get lodging at two different locations to minimize driving. I made mandatory reservations back in October. Our first was a place near Scotty’s Junction in Nevada to be closer to the northern points-of-interest and the second would be at Furnace Creek, the main tourist center, 75 miles away. Unfortunately, the disastrous rains in early 2017 severely damaged NV 267 and forced its closure. Scotty’s Junction is closer to Ubehebe Crater, Mesquite Spring and Scotty’s Castle. Also, the one-way road through Titus Canyon, another access route into the park and a highlight drive in itself (4WD recommended), was also closed due to flood damage. (To my disappointment, Titus Canyon opened up a day or two after we left.) We wound up being ‘stuck’ at the first accommodation, an hour’s drive from the only remaining eastern park entry, a lot of unwelcome driving. The first thing that struck me was the abundance of mountains along the I-95 corridor. I had always thought of Nevada as one great big desert. The Sierra Nevadas are the western margin of a whole series of north-south-trending chains mostly in the Silver State and in parts of California, New Mexico, Arizona and Mexico, a vast area called the basin and range province. 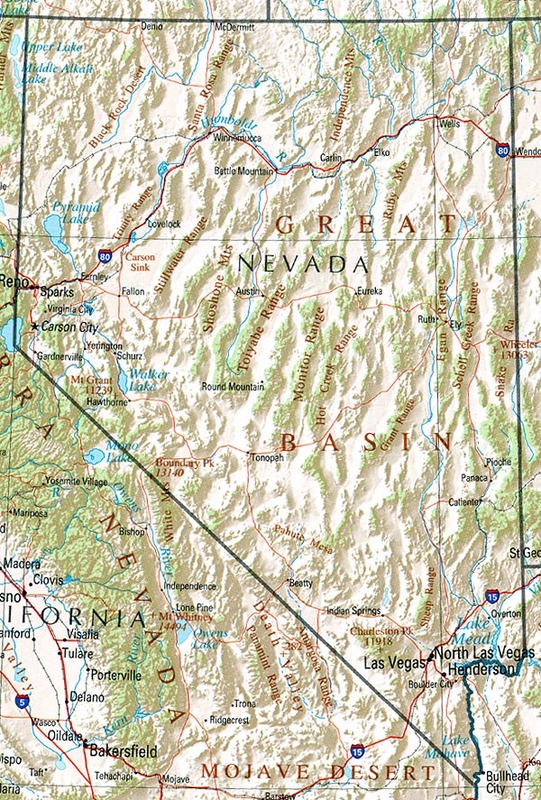 In fact, Nevada is the most mountainous state in the lower 48, another thing that surprised me. Death Valley National Park is no less renown for its eponymous valley than the Panamint and Amargosa ranges that dominate the skylines. Nowhere better was I going to see first-hand basin and range topography where narrow mountain ranges are separated by wide, desert valleys, a mountain and desert arrangement created millions of years ago by the stretching and thinning of the continental crust. Parallel crustal blocks broke along fault lines and tilted away from the bulging hot mantle below. The planes of a crustal block meeting at an apex line became mountain ranges and those along adjacent blocks filled in with sediment to become basins (or valleys). The basins are relentlessly being robbed of moisture by the mountains, creating deserts like Death Valley which lies between the Panamint and Amargosa ranges. Death Valley got me wondering again about the complex, sometimes violent geologic forces at work. The arid Southwest topography does that to me. Death Valley is a lab for geologists, one of the most studied parks in the system. Some rock formations date to more than 1.7 billion years. Canyons in particular have lots to show. The last things I expected to see were marble walls. There they were in Mosaic Canyon. I touched the surface, smooth enough to be a sculptor’s handiwork, except it was dolomite polished from eons of water erosion. More amazing still was that it was warped into folds done long ago by enormous heat and pressure. On top were layers of conglomerate with rocks of all sizes cemented together by mud and sand, lots of it fallen off to become stone and gravel litter or swept away into the valley. Park ranger Matt led a group of us into Golden Canyon where he talked about the relentless process of canyon-making. Water from rains, with no vegetation and soil to absorb water, race down the mountains and hills to produce stupendous flash floods, moving enormous amounts of scouring rock and debris between crevices or faults that become wider and deeper with time. He pointed to wave marks high on the walls made by ancient pluvial Lake Manly that only 150,000 years ago was hundreds of feet deep. My wife and I continued by ourselves deeper into Golden Canyon to Red Cathedral, its iron-rich color reminding us of Bryce. I was treated to an unexpected surprise. Ranger Matt announced that Artist’s Drive just opened to the public that day after a three-month closure. Repairs to damage caused by flash floods in 2015 had to be finished. Besides driving roller-coaster-like over the contours of an alluvial fan, the most interesting part of the attraction was to get up close to eroded, pastel-colored rocks when exploring the Artist’s Palette area. The red, pink, yellow, mauve and green colors are imparted by iron, manganese and chlorite compounds in the volcanic rock and ash. Death Valley is the story of salt. Salt is an enduring presence and one of the unique characteristics of the national park to which I’ll devote a separate post. I hoped on this trip that the historic California rains would have supplied enough water to make possible a wildflower bloom that would approach 2016’s. A ‘superbloom’ in Death Valley happens very rarely and under a specific set of environmental circumstances. It happened last year. But, I was sadly disappointed. All that winter wetness didn’t have the expected effect. A park ranger said the most important rain is one that needs to happen around October, which it didn’t last year. I would have to wait until I got to Anza-Borrego Desert State Park. It took a while, but I finally made it to Death Valley. I’m more appreciative of what it has to offer. Certainly, it’s more than a desert. Despite spending five nights in and around the park, there were still more things to see, which will have to wait for the next trip.